We are pleased to announce a gorgeous litter of 5 f1b petite mini Goldendoodles born December 5th. Based on their 21 pound Goldendoodle mom and 16 pound mini Poodle dad, we expect this litter of puppies to be 13-25 pounds full grown. All five of these petite mini Goldendoodle puppies have wonderful personalities and get along with everyone they meet! We believe they will make outstanding family members for a few fortunate forever homes. Goldie is a precious little girl with big eyes and an even bigger heart. She loves her family and siblings and is so easy to love back! Goldie’s thick, wavy/curly coat is super soft and is a beautiful apricot color. She is sure to make a lucky family very happy! 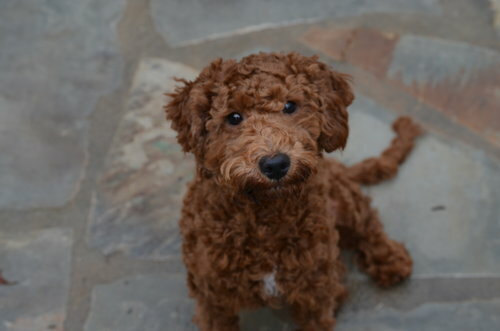 Ginnie is a lovely little Goldendoodle with sweet, lovable spirit! She will receive many compliments for both her gorgeous tan coat and her friendly personality. We are confident that Ginnie will be a fantastic companion! Griffon is a super cute mini Goldendoodle boy who loves to please us. He has a handsome red coat that is very thick and soft. Griffon is loving, loyal, and very sweet, and we think he will be a great addition to any family! Gismo is an absolutely adorable mini Goldendoodle with a very sweet personality! He has a soft, beautiful frosted apricot coat and an adorable little face you just can't say no to. He is also very intelligent and loves playing with his siblings! Glint is a cute, red mini Goldendoodle who definitely exhibits his Golden Retriever heritage. He loves being around us, and is loyal, friendly and affectionate. Glint is sweet and should fit in perfectly with any loving family!